Ah, Kafka! That cheerful blighter who requested that all his unpublished works should be burned after his death. Usually, I agree with this assessment, because I find his stuff a bit grim, to say the least. This performance – Colin Teevan’s adaptation of the short story,A Report To An Academy – went some way towards making me warm to the cheerless old Czech. This one-act, one-hander begins with the entrance of “Red Peter”, a “former ape”. In bowler hat and dinner jacket, he looks more like a beetle, bringing to mind perhaps Kafka’s most famous work, Metamorphosis. But unlike Gregor Samsa’s tale of dehumanisation, Red Peter’s story brings us the opposite. Through his lecture, which is interspersed with flashback scenes, he tells a tale of humanisation, how changing his behaviour to fit in with the society that traps him, has led only to alienation from his species and from his true self. We hear how he was captured on the Gold Coast and transported in chains and close confinement below decks, suffering abuse and deprivation along the way to his new home. This sequence brought to mind the horrors of the slave trade. Red Peter, now ‘civilised’, is neither fish nor fowl. He is not human like the rest of society and neither is he the creature he once was. His assimilation has come at a terrible cost, and he, like Kafka’s other protagonists, is ultimately, totally alone, scarred by experience and mistreatment. There is also the idea that our evolution into an industrialised society goes against what is natural. But the telling of this tale lifts the material into something joyous. Kathryn Hunter astounds as the civilised ape. Impossibly flexible – perhaps she has had her skeleton replaced by rubber bands – extremely expressive, articulate and very funny, she impresses at every moment. For all Red Peter’s eloquence, the beast is never far away. The trappings of civilisation are only a mask for our own animalistic impulses, after all. At under an hour in length, Colin Teevan’s script gets the most out of the source material, but I found myself marvelling at the brilliance of the performance rather than feeling any attachment to the character or being implicated in his plight. Rather, the piece is an intellectual exercise – like any lecture to an academy – that has given rise to the considerations I’ve mentioned here. The best moments are when Hunter (her name is ironic given the context) goes off script and improvises with victims from the audience, making monkeys of them, so to speak. It is a bravura performance from a unique and brilliant artist. I only hope for her sake that the I Was A Teenage Werewolf hairdo is a wig. 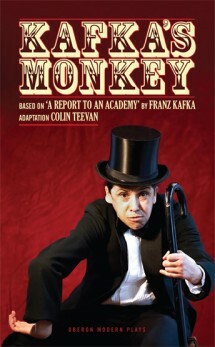 This entry was posted on Friday, June 1st, 2012 at 6:23 am	and tagged with A Report To An Academy, Colin Teevan, Franz Kafka, Kafka's Monkey, Kathryn Hunter, review, Warwick Arts Centre and posted in Theatre Review. You can follow any responses to this entry through the RSS 2.0 feed.